For a limited time, teeth whitening for only $299! With the light-activated teeth whitening technology, see dramatic results in less time than your lunch break. Safe, pain-free, affordable and used by over 10 million people. Call us today: 281-265-3567 or contact us here. Your smile is the way you greet the world. While you have many options for whitening your teeth, your dental professional is the best resource for whitening treatments. Only dental professionals have access to the most powerful, professional-strength whitening and can ensure your treatment is safe and your results are outstanding. Zoom is the number one patient requested professional teeth whitening brand. It offers a full range of “in the office” or “take home” whitening treatments based on your needs and your lifestyle. 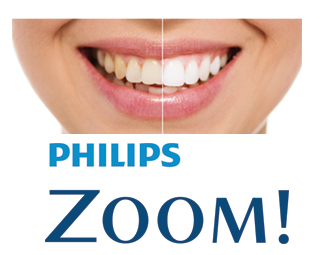 Professional teeth whitening with Philips Zoom is safe, pain-free, affordable and used by over 10 million people. Call us today: 281-265-3567 or contact us here.